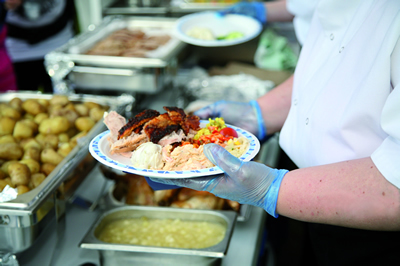 Menus can be specifically designed to suit the individual occasion or corporate event. We support as many local farmers as we can and in return they supply us with first-class quality produce and meat. Fresh farm produce goes into making our in-house speciality salads, pastas and rice dishes. New potatoes and vegetables to accompany our versatile menus prepared just for you. A chilled self-serve salad bar with a selection of popular salads please choose 5 salads from the list i.e. Spicy tomato pasta salad , fruity Moroccan couscous, roasted mediterranean vegetable pasta salad, biryani rice salad, new potato salad, creamy coleslaw, Caesar past salad, Tomato Mozzarella and fresh basil salad, Greek salad, waldorf salad, mixed leaf lettuce, cherry tomatoes and cucumber. Please note – we take into account special dietary needs too. Prawns, squid, cuttlefish, mussels, red peppers, green beans, authentic paella rice, saffron, etc. Pork, chicken, (rabbit), red peppers, butter beans, green beans, authentic paella rice, saffron, etc. A combination of our seafood and mountain paella. Red peppers, green peppers, cauliflower, green beans, broad beans, butter beans, authentic paella rice, saffron etc.